Why are air sealing and attic insulation so important? Support Rural Broadband! Send your Message to Members of Congress! 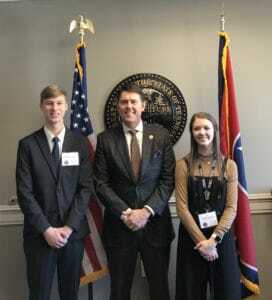 Macie Lemmons and Brayden Pearson of Bedford County were sponsored by Duck River EMC to attend the Tennessee Electric Cooperative Association’s 2019 Youth Leadership Summit March 3-6 in Nashville. Delegates to the annual event received a hands-on look at state government, participated in networking and leadership activities and developed a better understanding of their local electric cooperative. While in Nashville, the juniors toured a neighboring electric cooperative, TVA’s Gallatin Fossil Plant, and visited the State Capitol Building. They learned the process required to pass legislation with students given the opportunity to debate and vote on mock bills. While visiting the capitol, they were able to visit the offices of their State Rep. Pat Marsh and Sen. Shane Reeves and sit in on a legislative committee meeting. They also heard from Tennessee leaders like Miss Tennessee Christine Williamson; Adam Hammond, anchor for Nashville’s NewsChannel5; and Trooper Jeffrey Buchanan with the Tennessee Executive Protection Detail. Delegates to the Youth Leadership Summit are encouraged to be leaders in their hometowns and use their talents to improve rural Tennessee. “It was such an amazing experience filled with so many new friends and new experiences that I will cherish forever,” said Lemmons. “It was so much fun. I met a variety of new people and learned about leadership,” said Pearson. 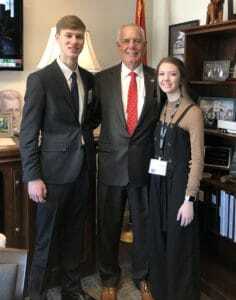 Meeting with Rep. Pat Marsh (top) and Sen. Shane Reeves (above) are Brayden Pearson and Macie Lemmons of Community High School. DREMC offices are open Monday through Friday from 8am to 5pm and closed on holidays. The Lynchburg, Chapel Hill and Sewanee offices are closed from 12pm-1pm for lunch. DREMC does provide a 24 hour a day, 365 days per year dispatch center to assist members outside of normal operating hours.